It's inspirational to see Bangor Castle Walled Garden featuring such a wide range of innovative items designed by local artists. 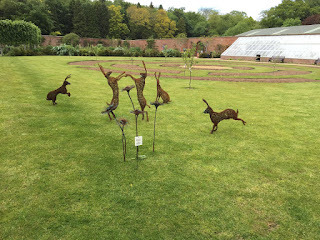 With a rich history Bangor Castle Walled Garden contains many features, plants, Band Stand and cafe which help make North Down a great place to visit or live, enhanced by the current Public Art sculpture exhibition. I greatly enjoyed the guided tour on Saturday and would encourage everyone to pop along and enjoy the exhibition and Walled Garden which is located opposite Bangor Aurora Leisure Centre.